Ball bearing pivot for swift, responsive blade deployment. Well designed, excellent machining, and smooth blade deployment. 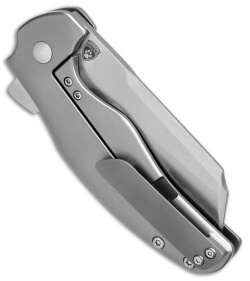 Kizer did their homework on this model. Smooth, 100% satisfied with this clever. This is the knife you need... The heft on this knife is undeniable. From the style of the blade, to the contoured handles, and the feeling you get when holding this piece is absolutely fantastic. The blade right out of the box is extremely sharp and ready for any cutting task you can throw at it. The ever so slight color from the pivot collar really puts a nice touch on this piece. Having a blank canvas of titanium is nice if you plan on anodizing. 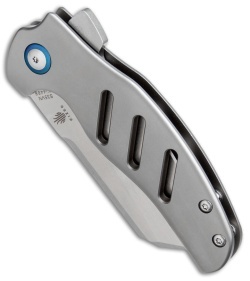 The pocket clip is nice and wide, which in turn really helps with holding the knife in the pocket quite well. The detent on this unit works in a way that makes you feel very secure. Also having an open construction on the back allows for easy cleaning when using compressed air to clear the minor dust particles that can naturally accumulate with time. Overall this knife is a real winner, and I am very excited to purchase the new 2018 mini and xl version of the sheepdog from Kizer. Although a Chinese company, you're getting your money's worth out of their products with confidence. 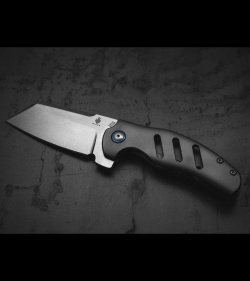 If you're contemplating on pulling the trigger on this purchase, consider it done, and enjoy the pleasures you'll have owning this knife. Flips smooth like every other Kizer on bearings. The heavy blade makes the action even better. It's a heavy knife, but that's to be expected from a cleaver style knife. If you want a big tanky knife, this is a great option for the price. This thing a a quality flipping tank! You would never think it was made in China. Quality is top notch. Knife is razor sharp. It's a little heavy and big for an EDC, but I do carry it on occasion. I would definitely buy this knife again if I were to lose it. This knife is absolutely fantastic. It is super smooth, super sharp, and was a super value. If I had to criticize one thing... I would like to have a little stronger detent. Solid lock up, no blade play, and perfect centering. Buy it, you won't regret it. 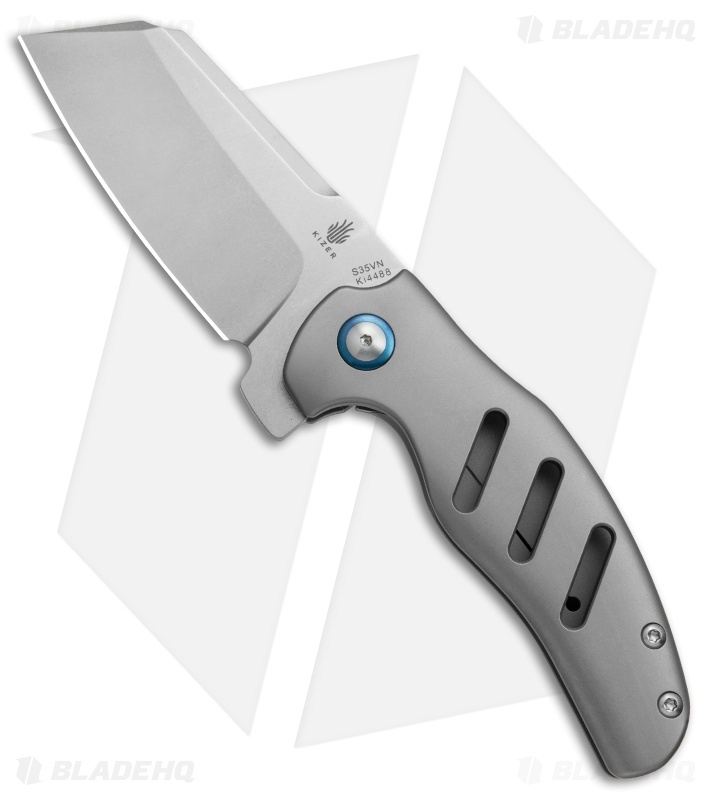 I have the blue scales, but this knife is absolutely one of my favorites! 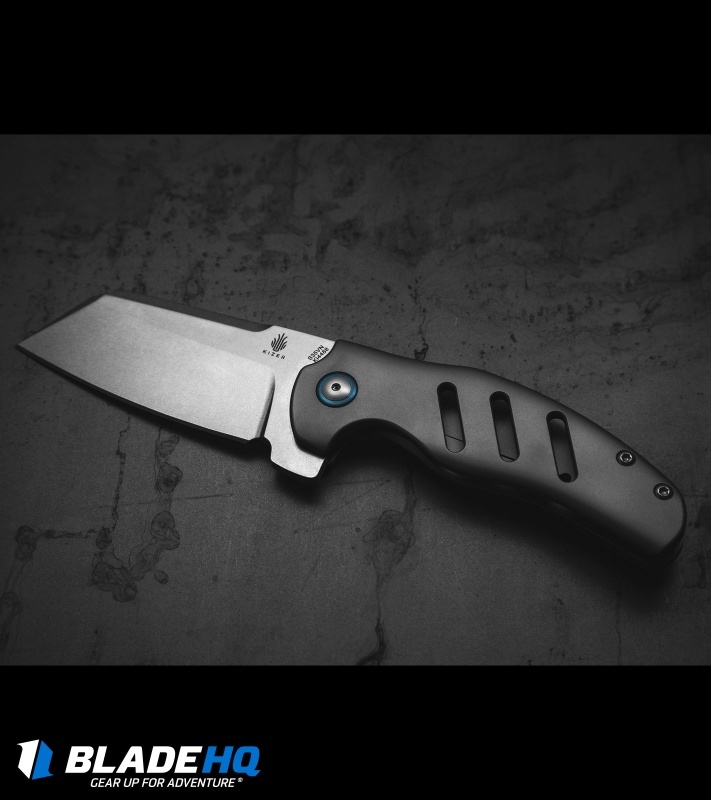 Kizer makes blades that might otherwise be unaffordable and makes them affordable without sacrificing quality. I like it a lot but it’s more of one of those knives that you like to show off more than use. But I’m sure it your needed to use it, it would hold up as it is such a solid feeling knife. I can honestly say that any time I see the words "Made in China", I make the following assumptions: cheap materials, poor QC, mediocre build. However, I can now, even more honestly say, Kizer has a convert in this knife owner. I ordered the Sheepdog and the Splinter recently due to the unique blade shapes and the fact that nowhere else can you get something with these premium materials for this price tag. When they arrived, I noticed that the packaging was a good quality and they came with a polishing cloth and a small zippered carry pouch. The fit and finish on the Sheepdog are near perfect, and the only minor pick I would have is that the detent which holds the blade in the closed position could be a hair stronger. This is largely due to the blade having so much weight in it that the closed position doesn't feel as secure as I'd prefer, but it is by no means "loose". The knife also came hair shaving sharp, and with a very consistent grind profile. My conclusion on this knife is that it is a great knife on its own merit, and an outstanding knife for the price. I plan on buying other Kizer blades before they see their market share increase too much and their unit pricing start to adjust upward because of it. First Kizer knife.... and I am impressed. Materials are all solid. No blade play, centered and sharp. Very good value for the money. Excellent authorized copy of a $750 custom for only 200$. Detent is good just different. Looks like it is located on the replaceable steel lock bar insert. Just got this thing in the mail. It's my first "high quality" k I've I've ever owned. And wow. It's so smooth and sharp. It was packaged very well. I wouldn't hesitate to buy this knife again. Awesome all the way around. I just bought the last one of the these that BHQ had in stock today. I was torn between this and the ZT 0456. In the end I chose this one. Mostly for the blade type and material. 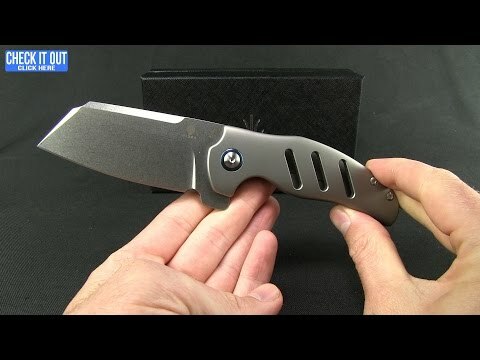 The titanium handle could use a little more color in my opinion and the blade could have been done in two tone but I really like this blade and feel like it will stand up to the daily chores I will be putting it through. In a couple months I will post an update on it's status and how it is holding up. Such a great knife with one exception. Kizer needs to strengthen their detents. Other than that this knife is perfect.